Important OpenGL was deprecated in macOS 10.14. To create high-performance code on GPUs, use the Metal framework instead. See Metal. OpenGL is an open, cross-platform graphics standard with broad industry support. 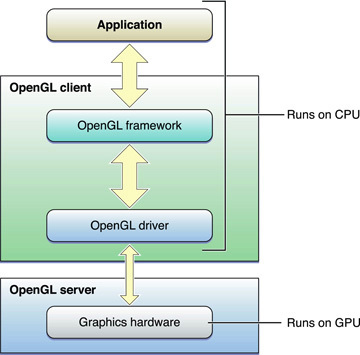 OpenGL greatly eases the task of writing real-time 2D or 3D graphics applications by providing a mature, well-documented graphics processing pipeline that supports the abstraction of current and future hardware accelerators. Reliable Implementation. The OpenGL client-server model abstracts hardware details and guarantees consistent presentation on any compliant hardware and software configuration. Every implementation of OpenGL adheres to the OpenGL specification and must pass a set of conformance tests. Performance. Applications can harness the considerable power of the graphics hardware to improve rendering speeds and quality. Industry acceptance. The specification for OpenGL is controlled by the Khronos Group, an industry consortium whose members include many of the major companies in the computer graphics industry, including Apple. In addition to OpenGL for OS X, there are OpenGL implementations for Windows, Linux, Irix, Solaris, and many game consoles. Because OpenGL is a C-based API, it is extremely portable and widely supported. As a C API, it integrates seamlessly with Objective-C based Cocoa applications. OpenGL provides functions your application uses to generate 2D or 3D images. Your application presents the rendered images to the screen or copies them back to its own memory. The OpenGL specification does not provide a windowing layer of its own. It relies on functions defined by OS X to integrate OpenGL drawing with the windowing system. Your application creates an OS X OpenGL rendering context and attaches a rendering target to it (known as a drawable object). The rendering context manages OpenGL state changes and objects created by calls to the OpenGL API. The drawable object is the final destination for OpenGL drawing commands and is typically associated with a Cocoa window or view. Depending on whether your application intends to draw OpenGL content to a window, to draw to the entire screen, or to perform offscreen image processing, it takes different steps to create the rendering context and associate it with a drawable object. Macs support different types of graphics processors, each with different rendering capabilities, supporting versions of OpenGL from 1.x through OpenGL 3.2. When creating a rendering context, your application can accept a broad range of renderers or it can restrict itself to devices with specific capabilities. Once you have a context, you can configure how that context executes OpenGL commands. OpenGL on the Mac is not only a heterogenous environment, but it is also a dynamic environment. Users can add or remove displays, or take a laptop running on battery power and plug it into a wall. When the graphics environment on the Mac changes, the renderer associated with the context may change. Your application must handle these changes and adjust how it uses OpenGL. Graphics processors are massively parallelized devices optimized for graphics operations. To access that computing power adds additional overhead because data must move from your application to the GPU over slower internal buses. Accessing the same data simultaneously from both your application and OpenGL is usually restricted. To get great performance in your application, you must carefully design your application to feed data and commands to OpenGL so that the graphics hardware runs in parallel with your application. A poorly tuned application may stall either on the CPU or the GPU waiting for the other to finish processing. When you are ready to optimize your application’s performance, Apple provides both general-purpose and OpenGL-specific profiling tools that make it easy to learn where your application spends its time. Many Macs ship with multiple processors or multiple cores, and future hardware is expected to add more of each. Designing applications to take advantage of multiprocessing is critical. OpenGL places additional restrictions on multithreaded applications. If you intend to add concurrency to an OpenGL application, you must ensure that the application does not access the same context from two different threads at the same time. Once you’ve improved the performance of your OpenGL application and taken advantage of concurrency, put some of the freed processing power to work for you. Higher resolution textures, detailed models, and more complex lighting and shading algorithms can improve image quality. Full-scene antialiasing on modern graphics hardware can eliminate many of the “jaggies” common on lower resolution images. If you have never programmed in OpenGL on the Mac, you should read this book in its entirety, starting with OpenGL on the Mac Platform. Critical Mac terminology is defined in that chapter as well as in the Glossary. If you already have an OpenGL application running on the Mac, but have not yet updated it for OS X v10.7, read Choosing Renderer and Buffer Attributes to learn how to choose an OpenGL profile for your application. To find out how to update an existing OpenGL app for high resolution, see Optimizing OpenGL for High Resolution. Once you have OpenGL content in your application, read OpenGL Application Design Strategies to learn fundamental patterns for implementing high-performance OpenGL applications, and the chapters that follow to learn how to apply those patterns to specific OpenGL problems. Important: Although this guide describes how to create rendering contexts that support OpenGL 3.2, most code examples and discussion in the rest of the book describe the earlier legacy versions of OpenGL. See Updating an Application to Support the OpenGL 3.2 Core Specification for more information on migrating your application to OpenGL 3.2. OpenGL Shading Language, by Randi J. Rost, is an excellent guide for those who want to write programs that compute surface properties (also known as shaders). Before reading this document, you should be familiar with Cocoa windows and views as introduced in Window Programming Guide and View Programming Guide. NSOpenGLView Class Reference, NSOpenGLContext Class Reference, NSOpenGLPixelBuffer Class Reference, and NSOpenGLPixelFormat Class Reference provide a complete description of the classes and methods needed to integrate OpenGL content into a Cocoa application. CGL Reference describes low-level functions that can be used to create full-screen OpenGL applications. OpenGL Extensions Guide provides information about OpenGL extensions supported in OS X.
OpenGL Specification provides detailed information on how an OpenGL implementation is expected to handle each OpenGL command. OpenGL Reference describes the main OpenGL library. OpenGL GLU Reference describes the OpenGL Utility Library, which contains convenience functions implemented on top of the OpenGL API. OpenGL GLUT Reference describes the OpenGL Utility Toolkit, a cross-platform windowing API. OpenGL API Code and Tutorial Listings provides code examples for fundamental tasks, such as modeling and texture mapping, as well as for advanced techniques, such as high dynamic range rendering (HDRR).